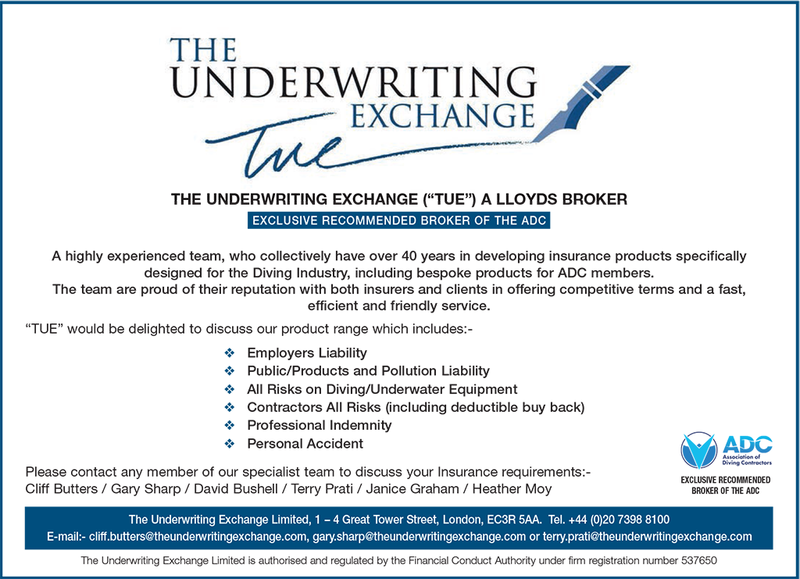 The ADC represents diving contractors who are involved with inland or inshore diving operations in the UK and Ireland. The Association of Diving Contractors (ADC) is the trading name of UK ADC Ltd, the industry body representing diving contractors working Inland / Inshore in the UK and Ireland. We are a Non profit member led organisation whose main aim is to ‘Promote Safer Commercial Diving’. With a membership that extends from the very smallest diving contractors working in swimming pools, rivers, lakes and harbours to those working in the outer most reaches of UK coastal waters in depths varying from less than 1m to a maximum of 50m. The sheer range and variety of activities carried out in this sector are almost as wide as some river estuaries where work takes place. Our Members are made up of diving contractors working Inland/Inshore in the UK and supply and support companies who have involvement in diving or marine works in the UK or overseas. Trade Associations exist where like minded companies, operating in a particular industry sector, group together in an effort to promote the common interests they may have in respect to improving their own work environment and that of all others working in the same sector areas. Particular focus is placed on achieving that ever so elusive ‘level playing field’ across the sector, as well as seeking to set common standards, achieve improvements in health and safety performance, technical matters or quality and more recently in properly considering the environmental impact of works being carried out by the Members. The Association seeks to achieve its objectives by promoting the industry sector to various interested parties, by the development and publication of guidance documents. Wider circulation is achieved by distributing a variety of Information Notes, Safety Alerts and various Codes of Practice to build on that required by or set out in Government Regulations. Our periodic Newsletters and regular Month Updates are powerful ways to keep members and others up to date, as well as promoting not only the general industry sector but it is also an opportunity to focus on a particular companies activities within the Association, who, from time to time work to standards or make achievements well in excess of that which could be considered as being “Best Practice”.